We were travelling from Lisbon to Porto on Easter Sunday. I woke up that morning to discover I had come down with a cold. Great! Getting caught in the rain the previous day in Sintra had probably not helped the situation either. After a three hour train trip, we arrived into what is possibly the most beautiful train station anywhere, São Bento Station. 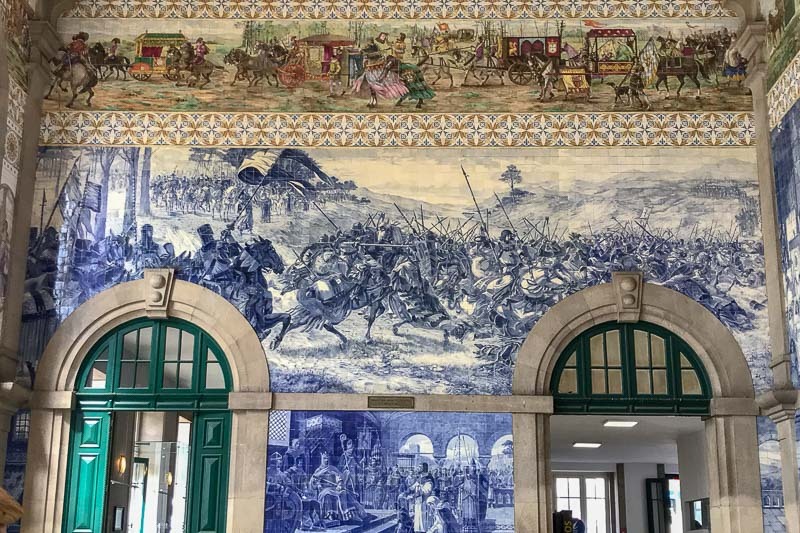 The walls are covered in amazing Portuguese tiles and depicting many historic scenes. The station was designed by a well known local with barely any experience and so while it was beautiful, when it was about to start operating, it was noticed that he had forgotten to include a ticket office. Whoops. One had to be added on to the side of the main hall. It is also interesting that the location was previously a convent. 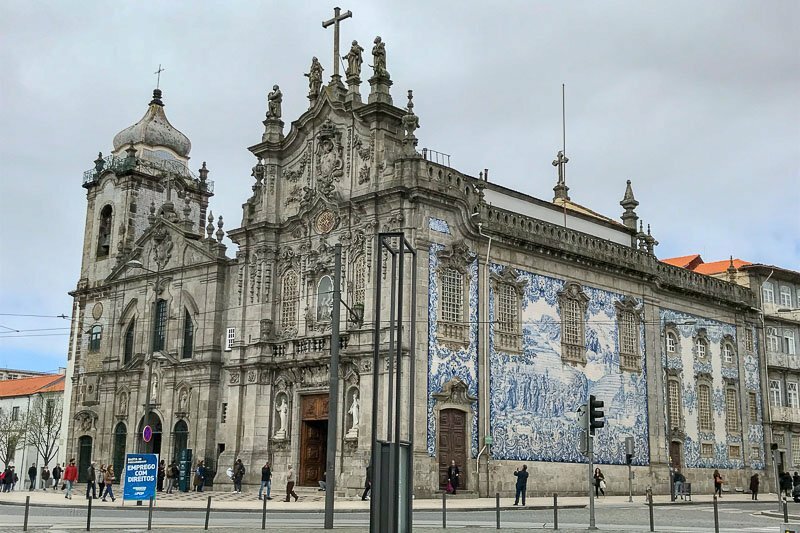 One of the over-riding historical aspects of Porto is that this was the seat of the Catholic Church in Portugal (Lisbon was the location of the royal families and the government) so pretty much everything in Porto was dictated by the church. When it was decided that the convent was the ideal location for the new modern train station, the only way the church agreed to let it happen was if the nuns who lived in the convent were allowed to continue to live there until their death. The last nun lived on and on, passing away in 1892, 58 years after the agreement was made. Her ghost is said to still haunt the station. 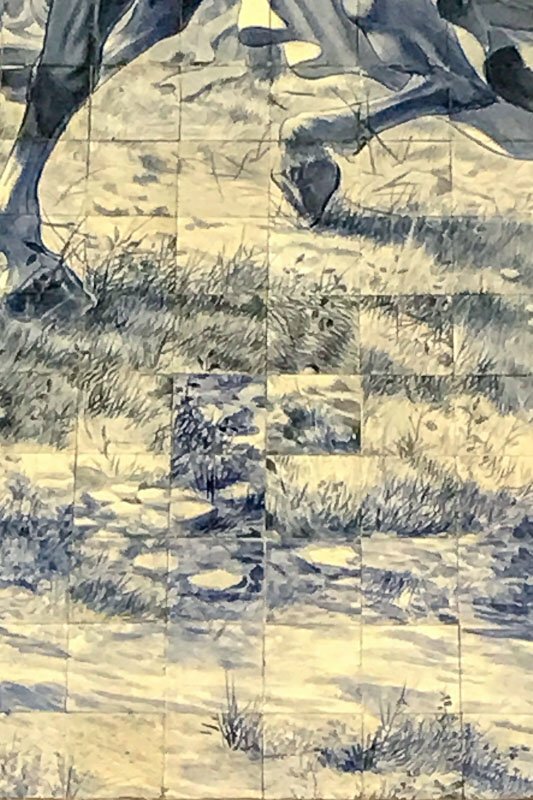 The train station tiles were considered to be perfect, and since nothing other than God can be perfect, three tiles were purposely put in the wrong place. We got settled into our wonderful hostel, the Nice Way Porto. I highly recommend this hostel if you are in Porto. It was perfectly located, had great facilities and even better staff. It was lucky I liked it so much, because the next day I ended up spending the whole day just hanging around the hostel, trying to shake my cold and avoid getting wet since it was raining again. 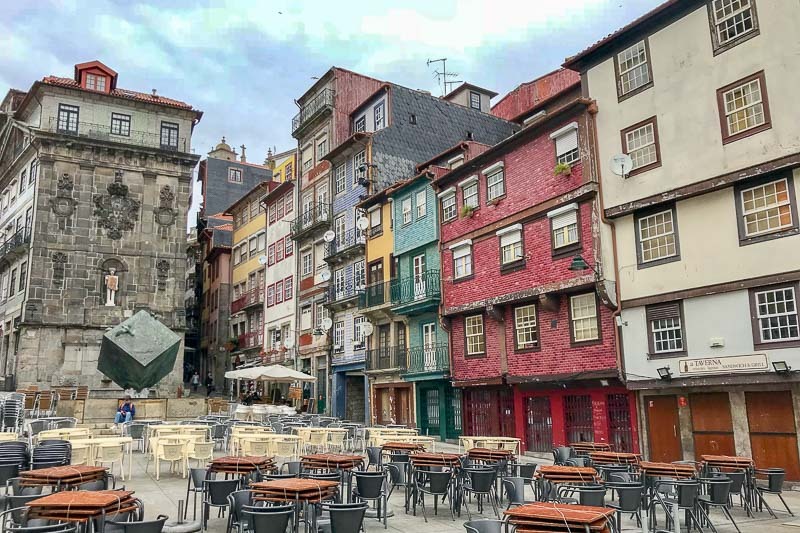 The following day we joined a free walking tour, run by Porto Walkers. The starting point was conveniently right near our hostel. 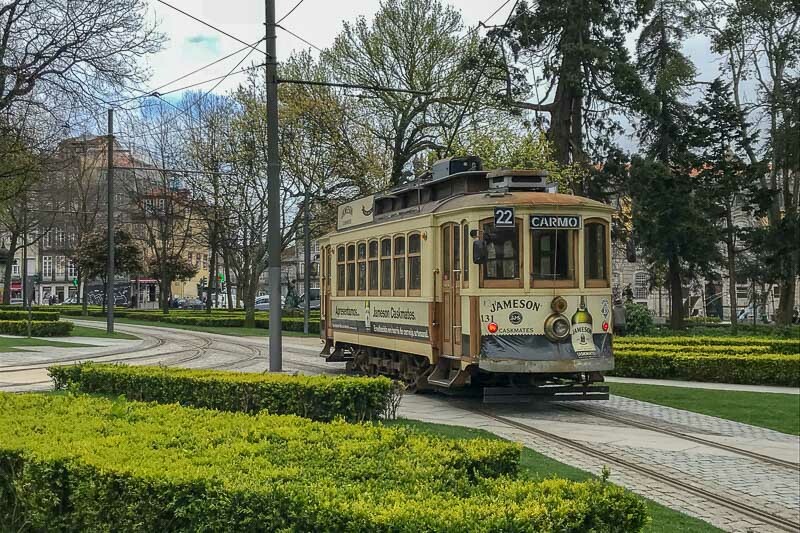 For about three hours we walked around the historical centre of Porto, including a stop at the São Bento Station (so if you are not coming by train you can still have a look). 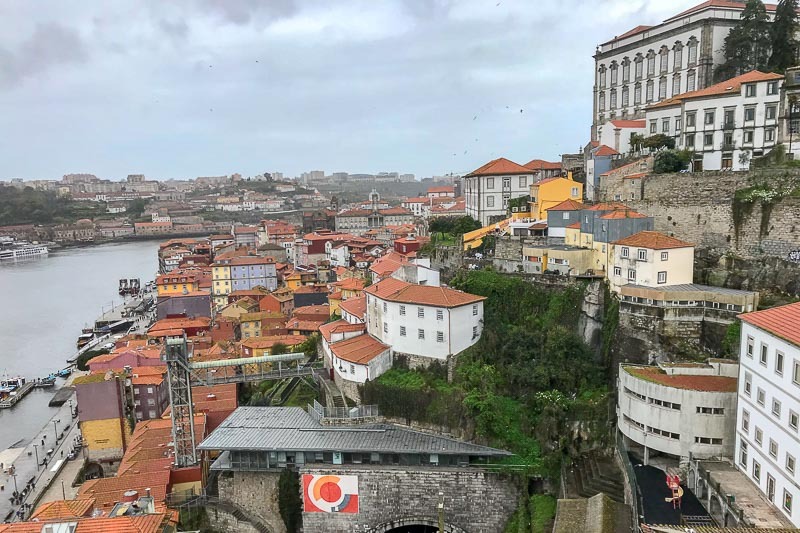 We got a fantastic overview of the history of the city and the origins of many of the buildings perched on the sides of the Douro River. The contrast with Lisbon is interesting due to the church. It influenced absolutely everything in Porto. There’s no royal palace here, it’s the former Bishop’s Residence that sits atop a hill dominating the skyline. 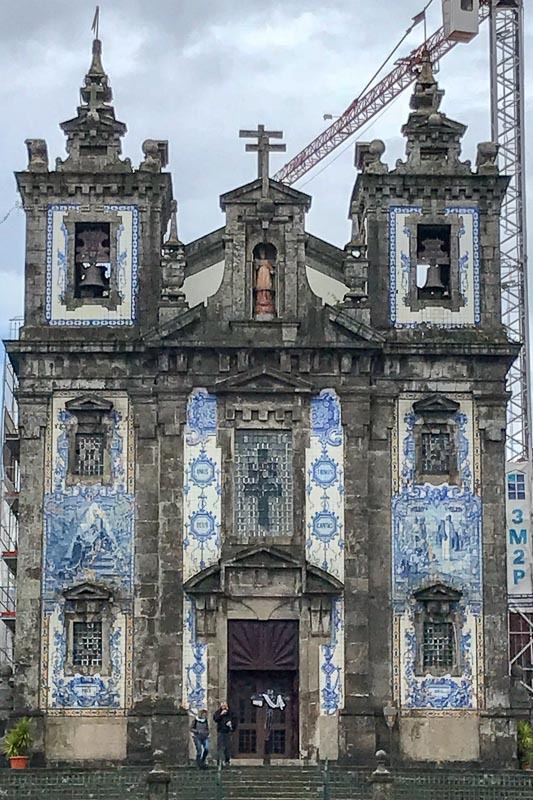 One of the many churches of Porto. This one is currently being renovated. 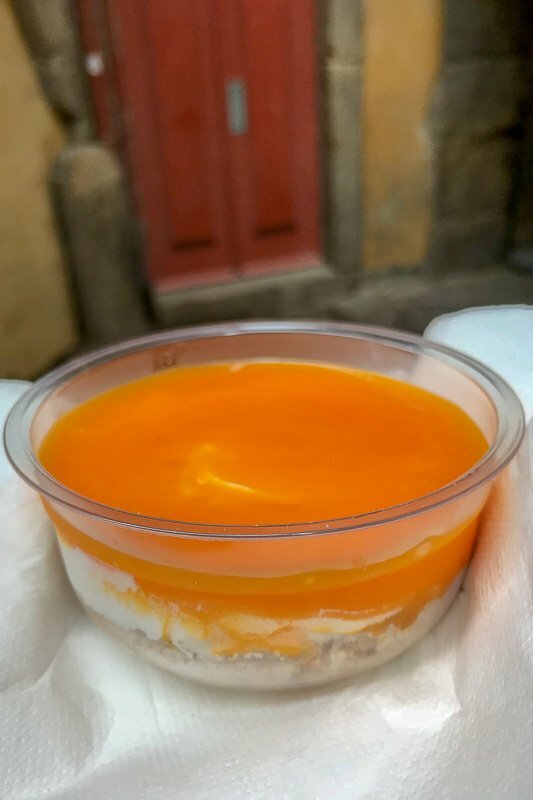 As we wound our way through the narrow laneways of the Port of Ribiera area we found ourselves at the back door of a catering business that allowed us to purchase one of their delicious desserts. They are a wholesale business and only sell to restaurants, so it was nice to be able to taste these local creations. Simon chose a version of chocolate cake, but I tried Natas do Ceu. This traditional Portuguese dessert is layers of crumbled biscuit, cream, and a special egg custard. It really does live up to its name, which when translated, means “heavenly cream”. The Port of Ribiera Square. The following day the weather was much better and this whole area was covered in umbrellas with all those tables full of diners. For dinner that evening we went in search of the most famous of Portos traditional foods – Francesinha. This over-the-top toasted sandwich includes bread (the thicker the better) filled with ham, sausage and steak, then covered in lashings of cheese and a special beer and tomato sauce. It is often topped with an egg and served with hot chips on the side. A local would easily eat this whole thing in one meal, but we had been warned to share, and if we wanted more to have another. Two places had been recommended to us, Cafe Santiago and Lado B. We ended up at Lado B, simply because it was the first of the two we came across. They are actually located only metres from each other, so if one is full, try the other. 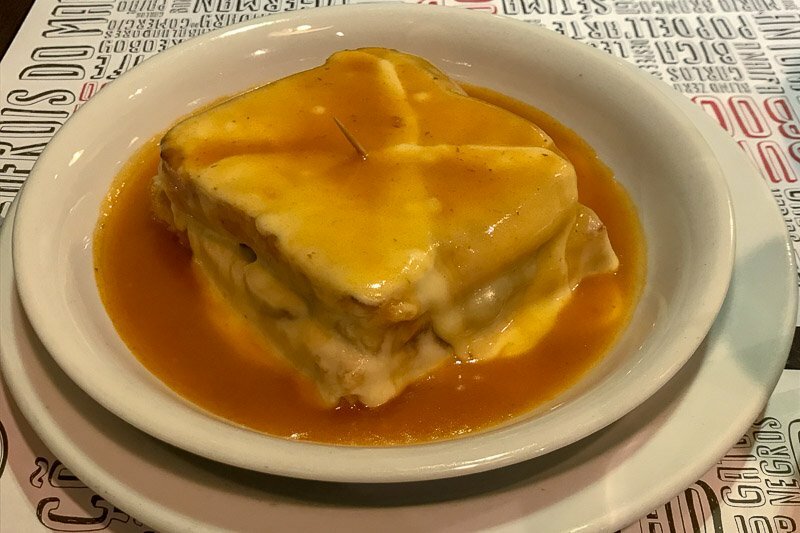 My thoughts on the Francesinha is that it really is a heart attack on a plate. It is so rich and there are so many calories in this! Sharing one was definitely the way to go. I could not have eaten a whole sandwich, especially since there were chips as well. The flavour was okay, but I am not a beer fan, so that detracted a little for me. Both of us were happy we tried it, and would eat it again, but it probably wouldn’t be our first choice. I can’t talk about Porto without touching on the links that it has to JK Rowling’s Harry Potter books. While none of our walking tours were focused solely on Harry Potter (I am sure there are probably some out there that do), there were many mentions of the books and stories weaved throughout. JK Rowling was teaching English in Porto when she came up with the storyline of the books and even wrote part of the first book while here. There are all sorts of rumours about how she came up with some of the characters and settings, but what is known is that she often spent time at the beautiful Majestic Cafe. While it looks lovely, and if you are a true Harry Potter fan it might be nice to visit for a coffee, our walking tour guides mentioned that it is quite overpriced now and the same food can be found cheaper elsewhere. The Majestic Cafe looks like it is straight out of a previous era when lit up at night. The beautiful bookstore Livraria Lello has also been linked to the Harry Potter stories. I have heard both that it was the inspiration behind the staircases inside Hogwarts, and Flourish & Blotts, the Diagon Alley bookstore. Thanks to Harry Potter it has become so popular that it now charges an entrance fee just to go inside, which I guess is kind of fair since so many people were visiting but no one was buying anything. That fee will be refunded if you purchase a book during your visit. We didn’t go inside because when we were there we didn’t have time to line up first at the ticket office a few doors down, then come back to the store and line up there to wait again. Livraria Lello is one popular bookstore! 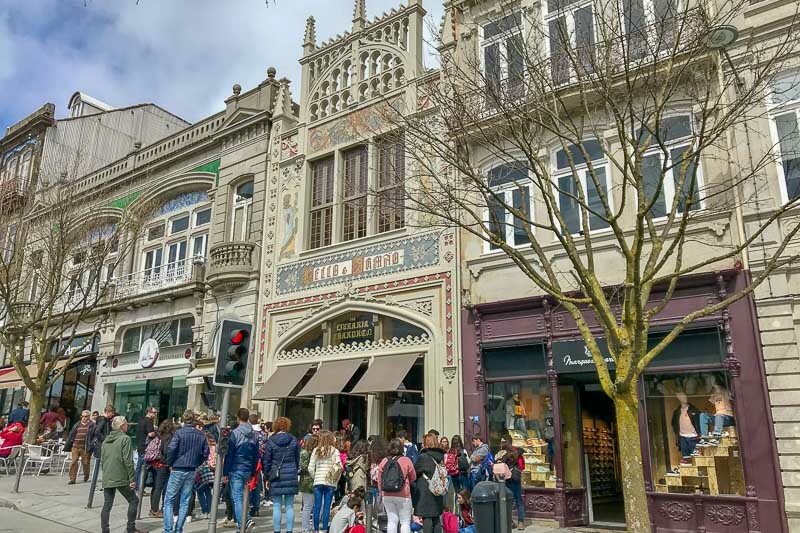 During our second free walking tour of Porto, we explored this area where Livraria Lello is further. There is a university not far away, and it is said that the way the students dress in Harry Potter has been borrowed from the students here. I assumed when I heard that, that it was some sort of ceremonial dress the students wore, but no, it’s what certain groups of students wear on a daily basis, cape included. As we walked past the campus, there were a whole group of students out the front, looking very much like they had just left Hogwarts. And for one last Harry Potter rumour – was Salazar Slytherin really named after Portugal’s very own dictator, António de Oliveira Salazar??? 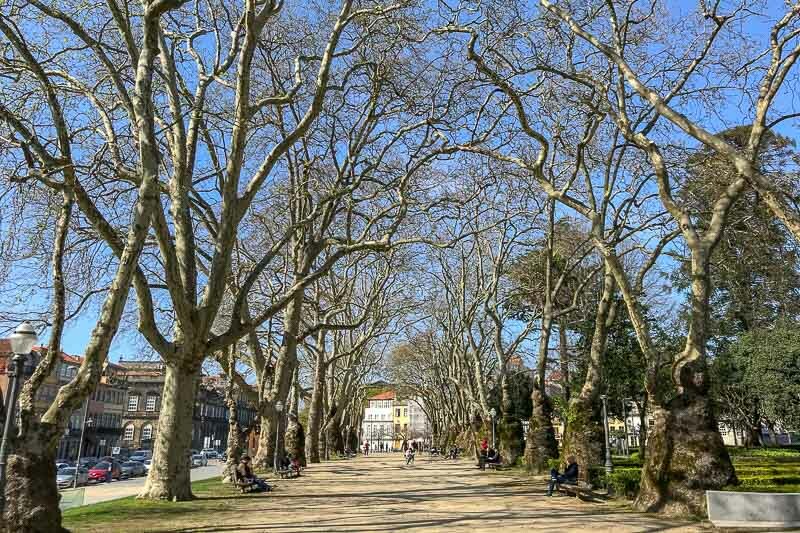 That second free walking tour was the Porto Lifestyle Tour also run by Porto Walkers. It took us through another area of the city with more stories and highlights. It’s always interesting to see how different problems have been resolved over the years. The below photo shows two different churches. They were built side by side by rival factions, with various additions continuously made to make sure each was the tallest of the two. At one point one the priests of the first church discovered that there was a law that said churches could not be built next to each other, and demanded the second one was torn down. 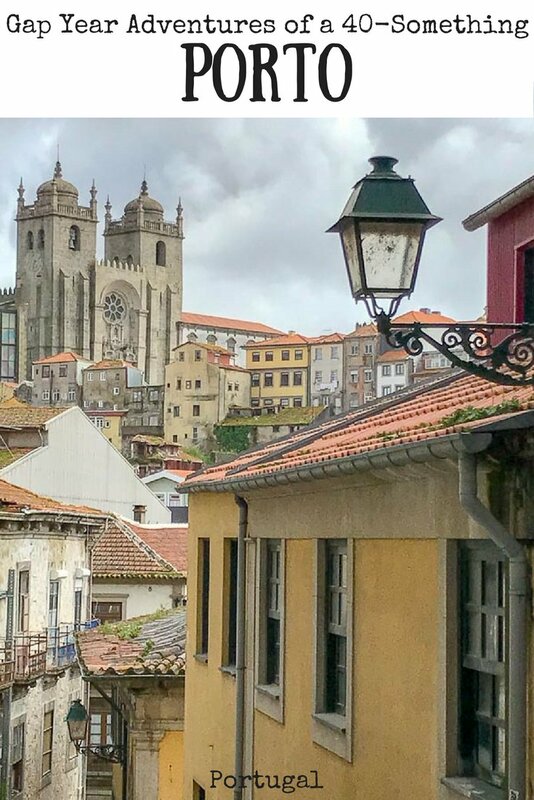 Instead of doing that, the second church built Porto’s narrowest house in between them, and various members of the church’s clergy lived in the house until 1980. The house is barely a metre wide. See the white window between the churches? The tour continued on through more areas of the city, with more lovely buildings and more stories. Porto really is an interesting city, and these Porto Walkers guides do a great job of bringing it to life. One of the lovely pathways. I can imagine this in summer with the trees creating a dappled shade to walk in. The view towards the Gardens of the Crystal Palace. It used to house a glass building similar to the famous one in London, now there is a controversial ugly dome there instead. We had a spare morning in Porto so we decided to go to the beach! Okay, so it was about 14 degrees Celcius, there was no way I was going anywhere near the water, but we caught the 500 bus from near the Dom Pedro IV statue (sort of opposite the Intercontinental Hotel) to go and have a walk around. While many of the tourist buses do this same trip, this bus that the locals use is much cheaper. We got off at Matosinhos and made our way down to the beach. 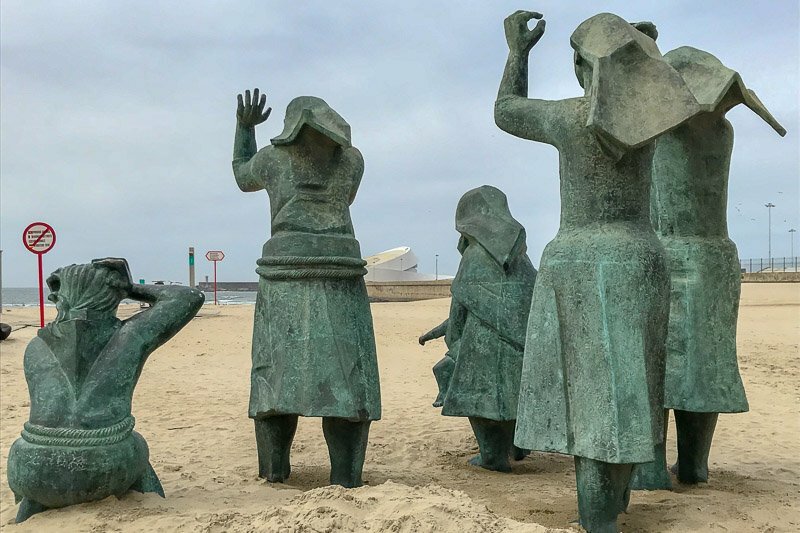 I noticed here that this beachfront walk is a small section of the Portuguese Way of the Camino de Santiago pilgrimage. I was a little excited about that, as this walk is on my bucket list. The weather was a bit wild, but I love being near the beach with waves pounding. I can imagine that this white, sandy beach will be packed with swimmers in the middle of summer. We eventually found a beachside cafe and escaped inside to get out of the wind and warm up a little, before catching the bus back into Porto. There is one thing though, that Porto is famous for all over the world, and that’s Port wine. Like Champagne, fortified wine can only now be called Port if it has come from this region. The grapes are grown further up the river in the Douro Valley, but ultimately all the wine is shipped down the river to be stored and aged here. There is a lot of conjecture over the name Port Wine, because, as I said, the grapes are grown further up river. The wine is also not technically stored in Porto. 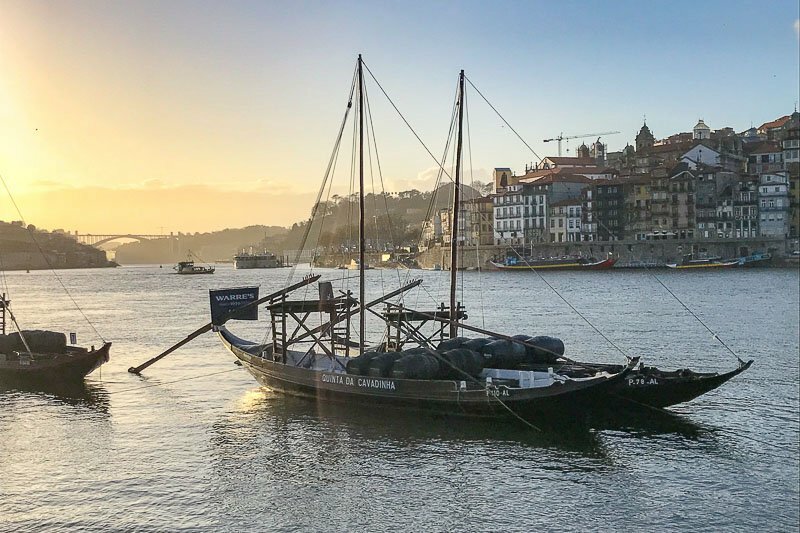 The best place for the cellars was on the opposite side of the river to Porto, so that the buildings were warmed just nicely by the sun. 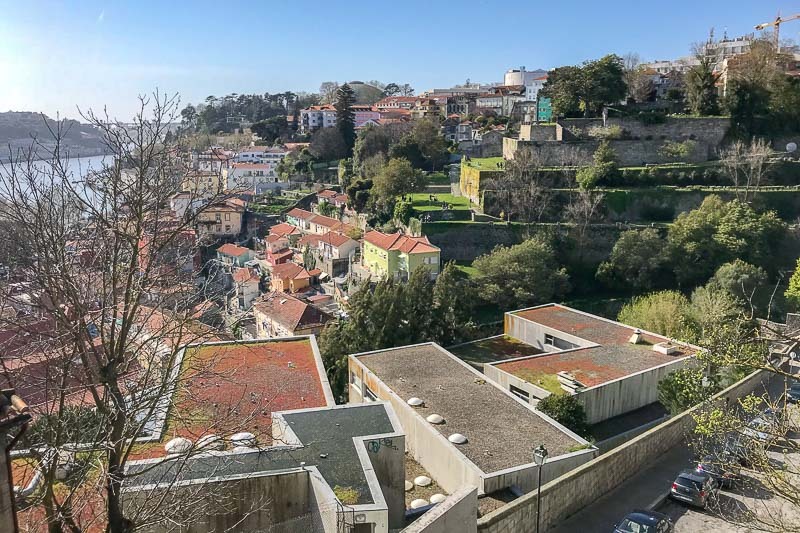 This area is a whole seperate city called Vila Nova de Gaia. 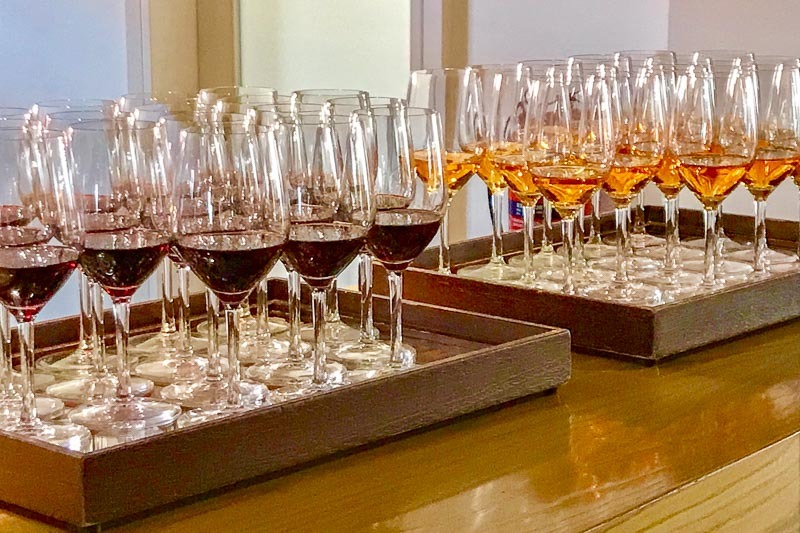 While I do like my wines, Port Wine (or similar fortified wines) has never been my favourite, but when in Porto, well, we just had to do a Port Wine Tour. Again we went with Porto Walkers because we were so happy with the free tours we had done with them. The half day tour, including tastings at three different wineries cost us €25 each. I’d love to tell you all the details of the tour, but after seven good sized tasting glasses, well… let’s just say I’m a bit of a lightweight when it comes to alcohol! 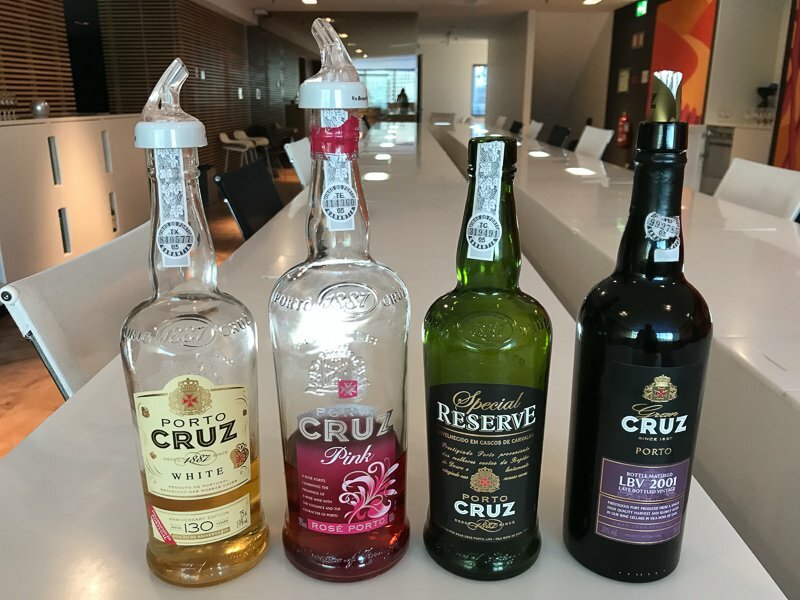 I had a fantastic time on the tour, we had a great bunch of people, and true Port Wine is definitely an improvement on many of the cheap versions I have tried over the years. I also did not know there were more than one type, I just thought it was all tawny port. My favourite of the three wineries was the boutique Porto Cruz, which produces a smaller run of premium wines. I’m not sure if they export to Australia, but I will be keeping my eyes open and will pick up a bottle if I see it. Our first tasting was at Ramos, a popular mass-market brand that was drinkable but not remarkable. 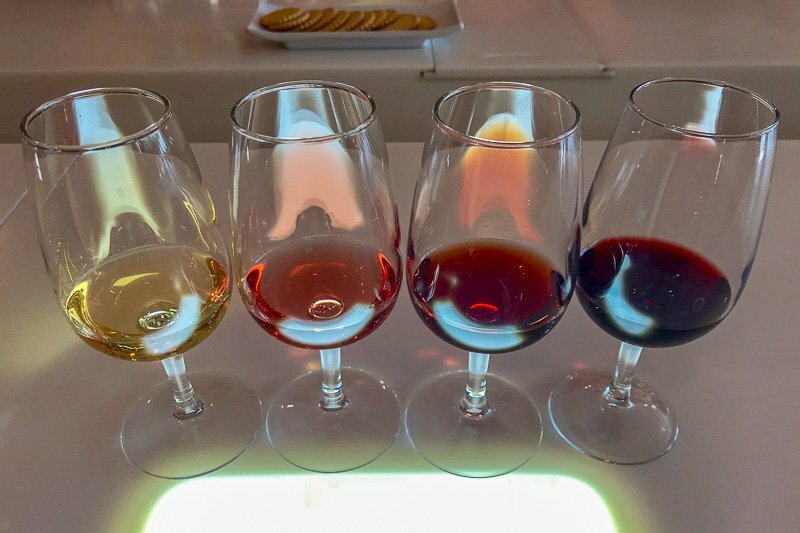 We got to use the professional tasting room at Porto Cruz with a lightbox at each seat to see the colours of the wine properly. As our guide said, we were only doing a semi-professional tasting, the professionals do not swallow the wine. 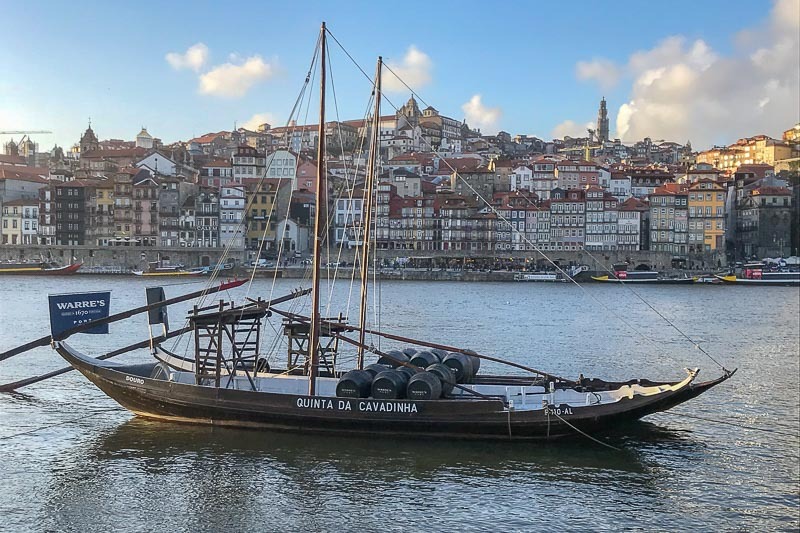 One of the traditional boats that brought the barrels of wine down from the Douro Valley in years gone past. Porto is in the background. 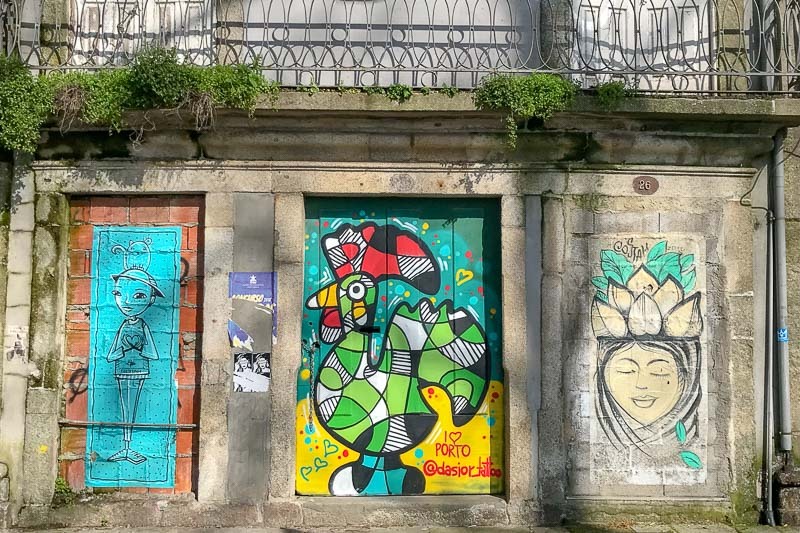 I liked Lisbon, but I really liked Porto! The city has a completely different feel about it, and there is some really interesting history and stories. I will definitely be coming back some day, to visit the Douro Valley and to see more of the city. As I have been writing this I have seen many things on Google Maps that I wished I had visited. 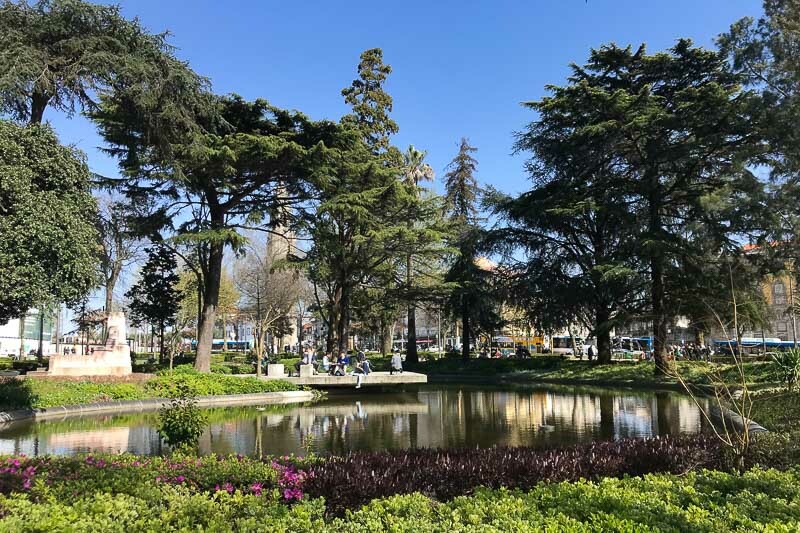 Portugal is cheaper to visit that all other Western European countries and for many that has been the appeal of the last few years. I think though that prices are increasing, particularly for tourist activities. There are still definitely bargains to be had, but you will need to search for local restaurants and lesser known accomodation to find those cheaper prices. Wifi in our hostel was fast and reliable, which was great the day I stayed in and worked. I Facetimed our families and had no issues at all with the connection, even with others at the hostel using the wifi at the same time. We had a SIM card while here, so were not relying solely on wifi when out and about, so I didn’t notice the availability as much, but it seemed to be prolific. We used public transport to get to the beach and then to get to the airport early on the morning of our departure. It was cheap and reliable for both of our trips. Me too! I can’t even tell you exactly why, because there is nothing wrong with Lisbon, I just liked Porto a little more. Wow love the look of the Majestic Cafe .. and the architecture of the Livraria Lello Bookstore. Added to my “Must Visit” List. Nice post. I’ve been to Lisbon and the Algarve but didn’t have time for Porto. I loved your photos and story about the history of the city. Thank you so much Sue. I hope you can get to Porto too one day. I still have to go to the Algave. Hahaha, yes, it’s pretty close, and that’s just how they like it! I love Porto and surrounds. I spent about 5 weeks here in 2016 researching it to update the new Rough Guides for that region. 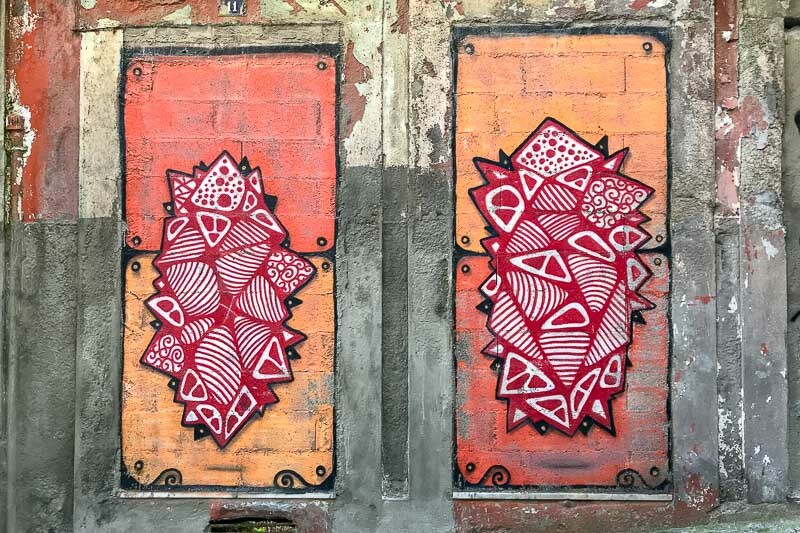 I love Ribiera District by the river, love the colourful houses and of course, The Moorish tiles. 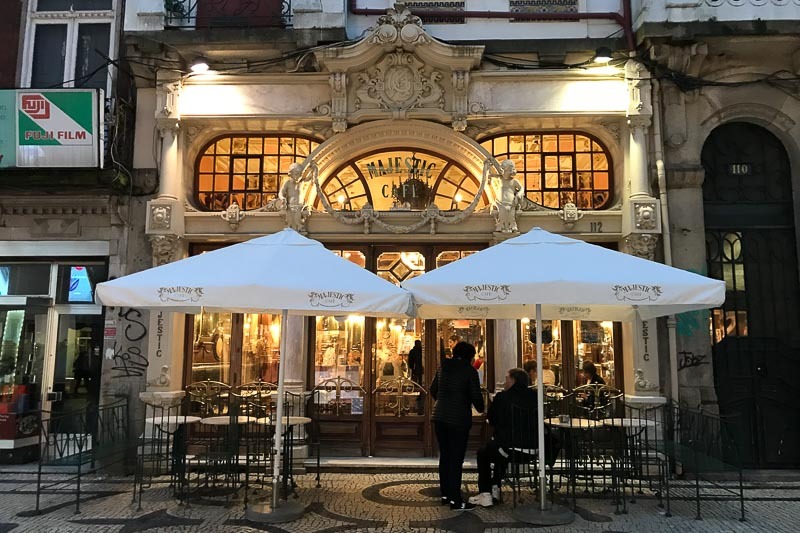 There is so much about Porto to love! Thanks Rebecca. Oh this is such a great post Josie. We are heading there next April. How do we find that free tour the walking one? I think I already love Porto and I haven’t been yet. Hi Josie, thanks for writing and recommending this article for our upcoming trip! I love how you’ve written it and these are exactly the things we interested in. I hope we’ll do both the walking tours and visit the train station on our trip.